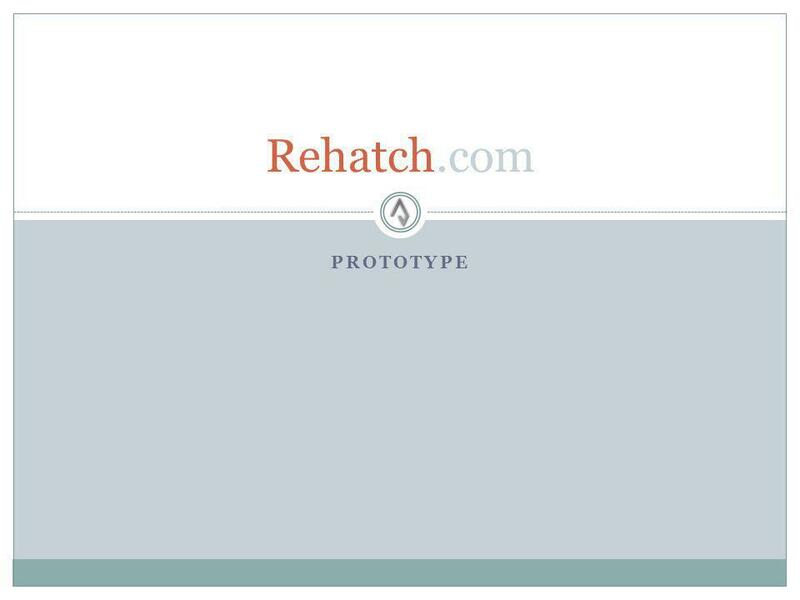 PROTOTYPE Rehatch.com. Rehatch $35k total; dispersed evenly over 6 months. Captures the unique niche from the top 20 networking sites. Infused with instant. 2 Rehatch $35k total; dispersed evenly over 6 months. Captures the unique niche from the top 20 networking sites. Infused with instant messaging, sophisticated mail service, blog, video chat, built in presentations section dedicated to sharing presentations online and other popular features. Everything is in real-time with aesthetically pleasing and easy to use buttons and layouts. Site breaks down based on registration type and caters to the purpose of someone registering for this site. This site understands that not everyone is on a networking platform like Facebook or MySpace. Business networking is a thriving market as well and similar LinkedIn sites are proving to be very useful and profitable. The site uses Google Adsense and will generate additional revenue from movie and music industries by allowing users to purchase movie, music and clips from both to be used throughout their profile and in presentations. 3 Rehatch Facebook dominates the social networking arena around students of all levels. 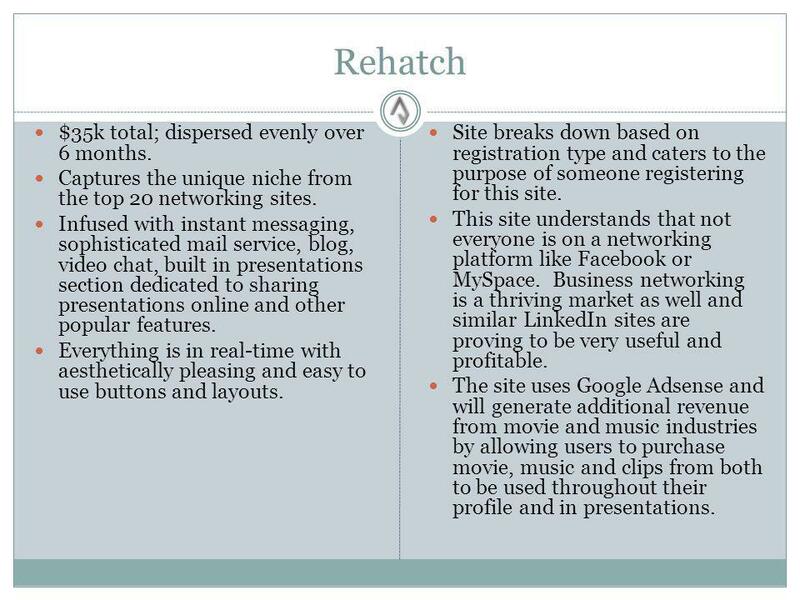 Rehatch will emulate that success and mold its student section to appeal to those types of users. MySpace is a social networking site thats the most prevalently used among individuals who want an online entity. LinkedIn is the most popular business networking site which is why the professional(s) section of the site will resemble features and characteristics of their website. Apple is famous for their robust products and aesthetically pleasing software and hardware. The company section of this site will cater to those companies who require a sophisticated online presence and wish to retain a high level of professionalism. Nike is one of the most well known companies for having a very cool website. The special registration section will be constructed using layout designs and flashy appeal to cater to those special users. This section is for parents to monitor their child's online usage. Additionally, this section will host other types of registration for users who do not fit the other four types of accounts. The special registration section is a revolutionary way for parents to monitor their children's internet usage, talk with other parents about online content and make new friends. The premise behind having five unique sections for this site is to help better understand who and when uses a networking platform. This will help produce a more intuitive user experience and demographic data will become significantly more organized. 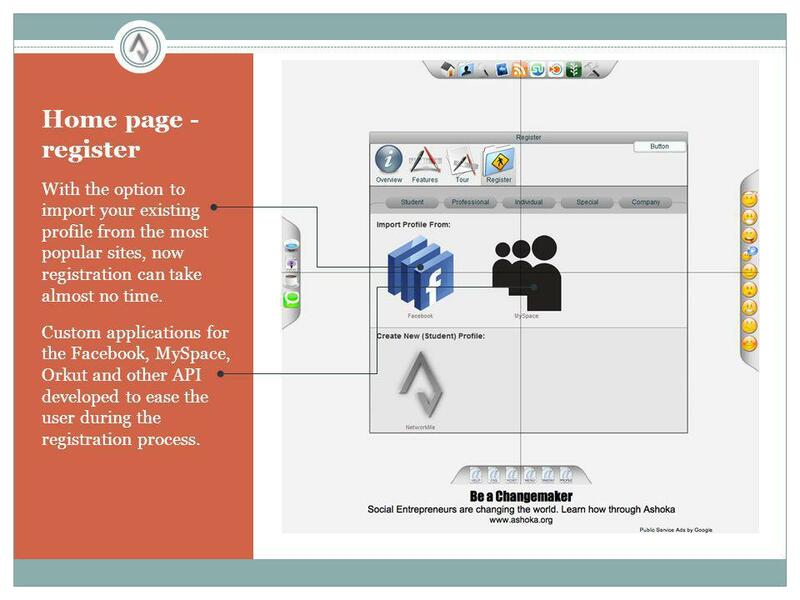 MySpace and Facebook both organize their site as a user to user registration rather than splitting up each category based on what the user is actually on the site for and what they are using the site to get accomplished. The presentations section of this site is versatile way to create online presentations for school, work and everything in between. They can be stored online, downloaded anywhere and sent to anyone. The idea behind it is to create as many partnerships with the movie and music industries and generate revenue through ad placement. For example, a user can create a presentation, realize they need a clip from a movie, scour our available clips, purchase the clip (we would be acting as an online iTunes) and use it throughout their presentation. Instead of viewing someone's profile and having their music automatically start playing, this site improves on that idea. You have the option to have your music stream (which you can purchase through us) or have your music pause when you are viewing someone else's profile (by default, your music plays and the other persons music is paused). Additionally, when customizing your profile, you can insert movie clips as well as music, all of which can be purchased through us. 4 Home page - overview Revolutionary 4-part menu system with built in tsunami effect. 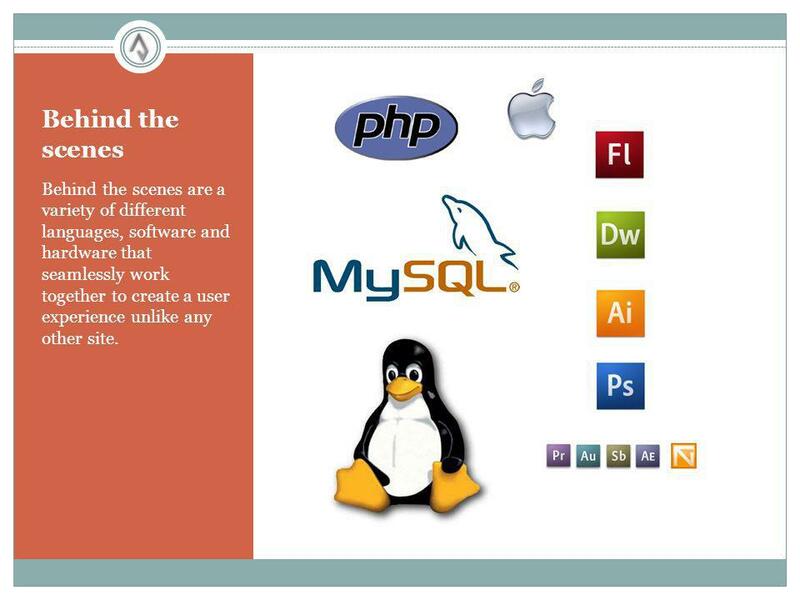 Easy to read and identify icons promoting most popular features. 5 Home page - overview A warmer welcome back message for the user invites them back to the site. 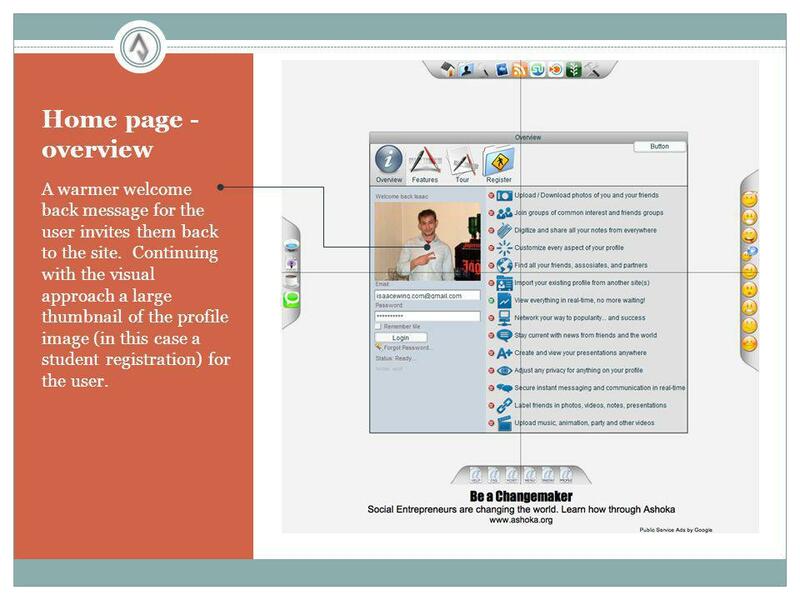 Continuing with the visual approach a large thumbnail of the profile image (in this case a student registration) for the user. 6 Home page - features Top 20 features break down in parts of four with large easy to see images. 7 Home page - tour This will be an interactive tool perspective users can use to see how the site works and how it will benefit them to use it. 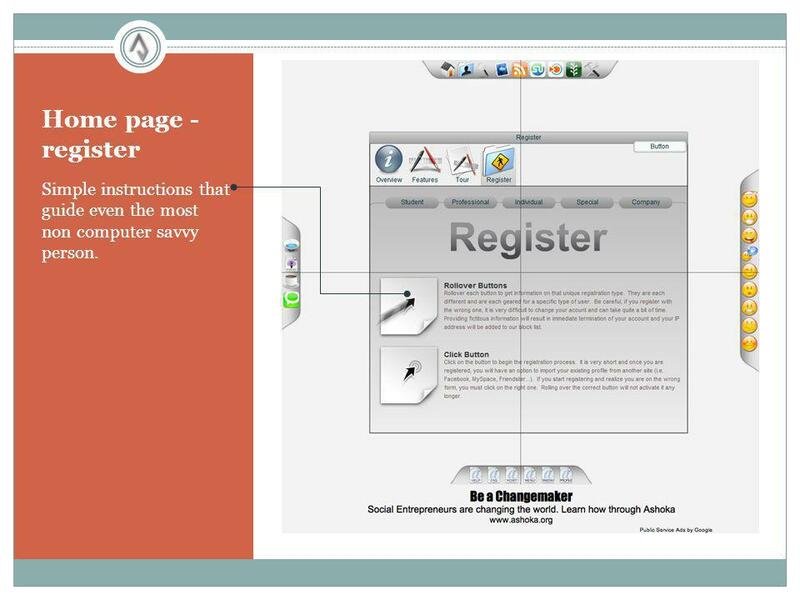 8 Home page - register Simple instructions that guide even the most non computer savvy person. 9 Home page - register With the option to import your existing profile from the most popular sites, now registration can take almost no time. Custom applications for the Facebook, MySpace, Orkut and other API developed to ease the user during the registration process. 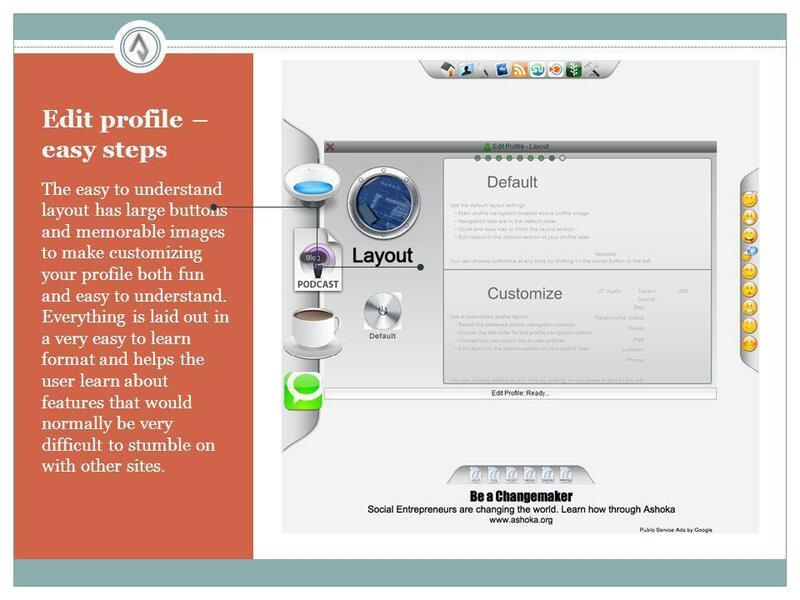 10 Edit profile – easy steps The easy to understand layout has large buttons and memorable images to make customizing your profile both fun and easy to understand. 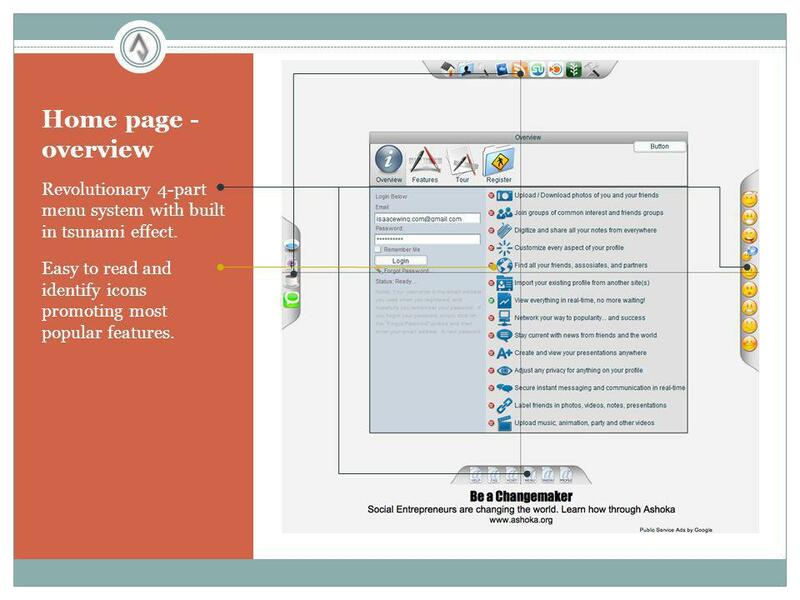 Everything is laid out in a very easy to learn format and helps the user learn about features that would normally be very difficult to stumble on with other sites. 11 Behind the scenes Behind the scenes are a variety of different languages, software and hardware that seamlessly work together to create a user experience unlike any other site. 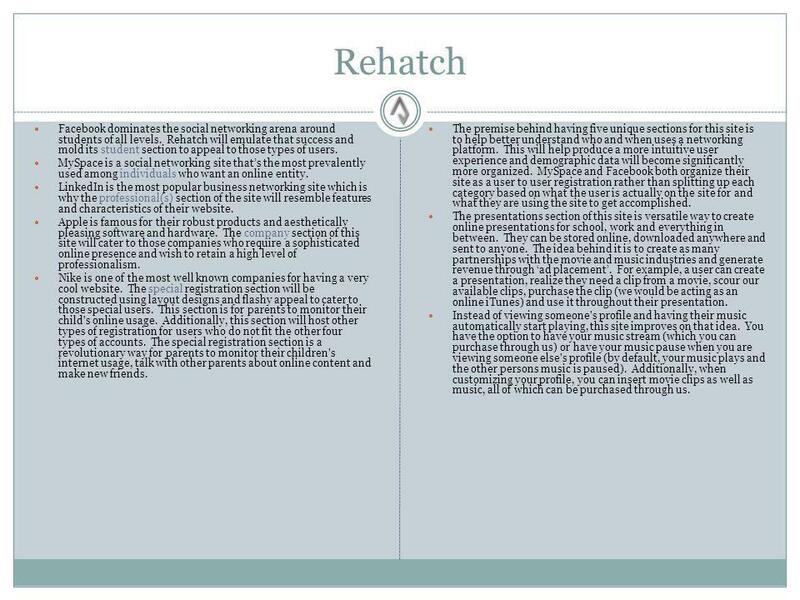 Download ppt "PROTOTYPE Rehatch.com. Rehatch $35k total; dispersed evenly over 6 months. Captures the unique niche from the top 20 networking sites. Infused with instant." Welcome to the Safer Internet Parent’s Workshop 18 th March 2014. Easy Website Creation Using WordPress Welcome and Thank You to our Sponsors. © Anderson Analytics, LLC All Rights Reserved Marketing to Women Social Network Services (SNS) Factoids March 2010. Certificates of Completion Online service by MyEducationPath.com is the directory of MOOC and online courses from different. The Impact of Social Networking David Schubert April 17, 2008. The Benefits Of Using WordPress To Build Your Internet Marketing Website WordPress is used by more web page creators Of the top million web pages, reviewed. MyIsagenix - Intro Class. Intro Class Agenda  MyIsagenix Overview  Getting Started  Page by Page Walkthrough  Q & A.
Online Presence for SAIPs What’s Online Presence?